Paper bag puppets are great fun and, with just a few cutouts and a bit of drawing, you can make a puppet for just about any type of performer. 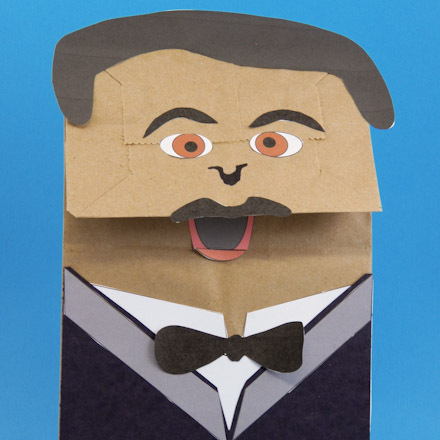 In this project make puppets of opera singers, tenor and diva, that open and close their mouths as you move the paper bag flap with your hand. Make up a concert or a play that uses the tenor and diva puppets, and maybe some other puppets of your own design. 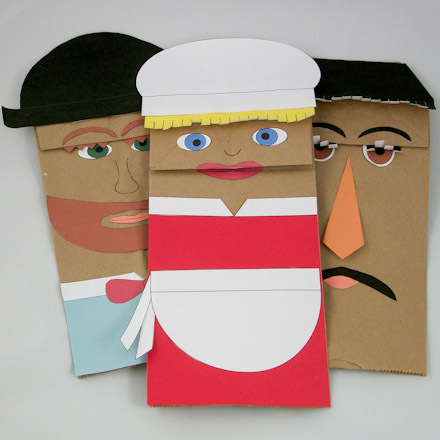 Related crafts: For more puppet fun, play included, see the Paper Bag Hand Puppets craft project with printable patterns for three funny people. 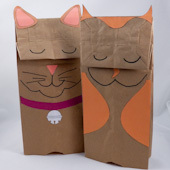 Or see the Cat and Owl Paper Bag Puppets craft project for how to make animal puppets using paper bags! 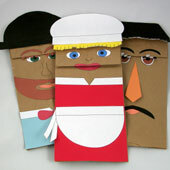 For more puppet craft projects, many with plays, see Puppets Around the World craft project index. Optional: Colored paper, yarn and fake fur. If you printed a black & white pattern, color the puppet cutouts any colors you like. Each pattern includes two sets of eyes—complete eyes and separate parts of eyes. Pick the type you prefer and color them. 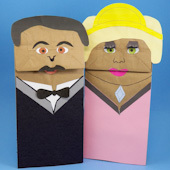 Colored paper cutouts are another choice. To make them, cut out the patterns, trace around them on colored paper, and cut. The Tenor puppet cutouts include eyes, mouth, eye brows, moustache, collars and bow tie. You also need to cut a shirt from a piece of white paper that is the width of the bag and about 3" long. For the jacket, cut a piece of black paper that is the width of the bag and 6" to 7" long, depending on the length of your bag. The Diva puppet cutouts include eyes, mouth, eye lashes, jewel, hair, tiara and collar. Cut the eyelashes into a fringe as marked on one edge. Wrap around a pencil to curl. For the gown, cut a piece of pink paper that is the width of the bag and 6" to 7" long, depending on the length of your bag. The tenor's mouth opens and closes as you move your hand. For the open mouth, glue the mouth cutout under the flap, aligning the bottom edge to the crease where the flap falls. For the closed mouth, glue the moustache on the flap and the lower lip just below the mouth. Glue the collar to the strip of white paper, and then glue it to the bag. Glue the jacket collar in a 'V' on the black paper, snip away the black paper inside the 'V', and then glue to the bag. Trim away any excess jacket length. The diva's mouth opens and closes as you move your hand. For the open mouth, glue the mouth cutout under the flap, aligning the bottom edge to the crease where the flap falls. For the closed mouth, glue the upper lip on the flap and the lower lip just below the mouth. Glue the gown collar in a 'V' on the pink paper, snip away the pink paper inside the 'V', and then glue to the bag. Trim away any excess gown length. Add any additional decorations you might like to complete the puppets. Yarn or fake fur can be added for texture. 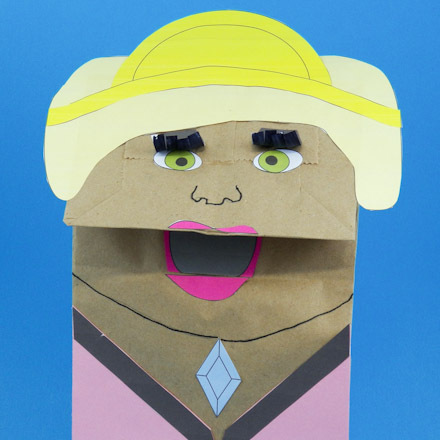 Draw a nose for each puppet and draw a cord for the diva's jewel necklace. Have some make-believe fun with your tenor and diva puppets. You could put on a concert featuring your new puppets. Tip: Lift the bag flap to open the tenor's eyes! Tip: The diva puppet is designed to open and close its mouth, too. Tip: See the Cat and Owl Paper Bag Puppets craft project for how to make animal puppets using paper bags.